Business interests in Charleston, South Carolina financed the construction of America's first commercial railroad in 1833 in an effort to capture a greater share of the upland cotton, which was formerly transported by raft or steamboat to Savannah, Charleston's rival port. 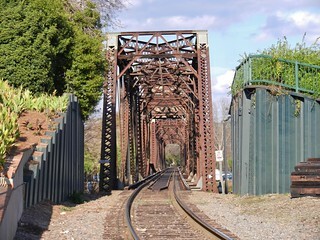 The South Carolina Railroad track was laid from Charleston to Hamburg, a town opposite Augusta on the Carolina side of the river. At that time the line was the longest in the world. The first locomotive to make the run was proudly named "The Best Friend of Charleston". During the same year, the Georgia Railroad was chartered in response to the agitation of interior Georgia towns anxious to get rail connections with the river at Augusta. Although Charleston and the middle Georgia towns had wanted to South Carolina and Georgia railroads connected, Augusta leaders stood firmly against any junction of the two lines within its city boundary, fearful that Augusta would lose its strategic position as a commercial center and sink to the status of a way station. Only after Charleston threatened to negotiate a river crossing elsewhere, and bypass Augusta altogether, was the bridge permitted to cross into Georgia. 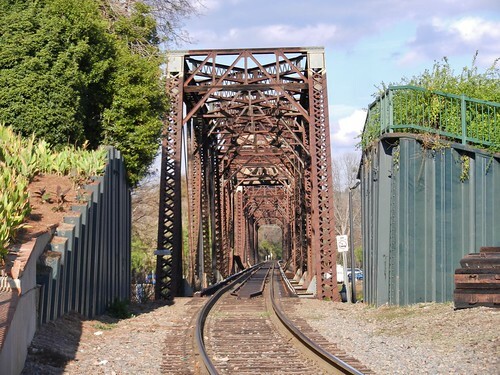 Railroad expansion in the latter nineteenth century brought numerous new lines to the city.